For some reason, I tend to get a lot of wrong-number SMS messages on my cell phone. For a while, an intermittently hilarious clique of fumble-fingered teenagers in greater Dallas (area code 817) made a point of keeping me (area code 718: you see the problem immediately) in the loop on their goings-ons. A woman in Denver texted me one saturday morning to inform me of the highly unlikely assertion that she was wearing my underwear. 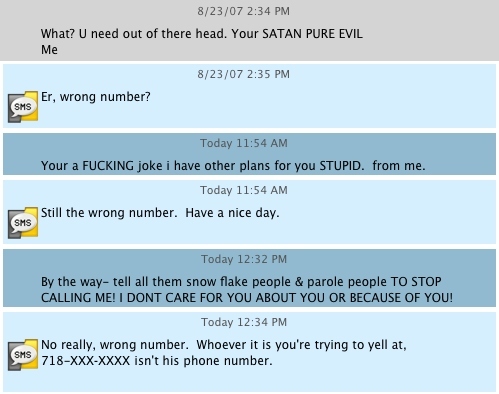 (She was embarrassed but gracious when I let her know she’d reached a wrong number.) A different woman in Albany NY (area code 518: same problem again) went so far as to send me a picture of her in her underwear — she sadly did not respond to my highly complimentary wrong-number message. I have to admit that I’m charmed by how this person makes certain to sign every message as being “from me.” Further updates as they happen. …because I can now say, with complete honesty and accuracy, that I’m friends with the guy who did all of Karl Rove’s dad’s genital piercings. I don’t recall ordering an extra ration of ambient surrealism for this month, but apparently I got it anyway. Playing with fire is a lovely hobby. Many people say so. Even more people do it even though they never admit to it in public. Yet somehow, those same people will often look askance at you if you insist on indulging in it their basement. And they’ll usually get downright snippish if you demand that they provide you with additional matches and kindling. It’s really best not to act surprised by this. People will assume, correctly, that you haven’t been paying attention. To what? To everything.